It’s not pretty out there. Here’s what I see from my windows. China publishes the largest number of new and revised book titles per year – 440,000. U.S is second at 304,912, and the United Kingdom is third at 184,000. UNESCO monitors the number and type of books published annually for each country, using it as an indicator of standard of living and education. The country with the lowest number of published titles is Oman, at 7 books. Oman is on the southeastern coast of the Arabian Peninsula, ruled by Sultan Qaboos bin Said al Said, and has one of the hottest climates in the world. I’m lucky I don’t live in Oman. I don’t like the heat. In a genre breakdown of Amazon’s top 54,000 bestselling books, 22% were fiction, 58% were nonfiction, and 20% were children’s books. The Association of American Publishers report that the US book and journal publishing industry generates over $27 billion annually. According to Publishers Weekly, Amazon controls 67% of the book market (print and e-books). Over a third of all paid e-books on Amazon are self-published. It should be easy for an author to get published in this world. Right? Wrong. One literary agent reported that she rejected a “modest” 90% of manuscripts submitted. The most popular agents reject up to 99%. So who’s making the money? The world’s bestselling author, James Patterson, is an ad-man-turned-author and has put his name to 130 novels – with only 20% entirely written by him. He maintains a staff of 23 “co-authors.” Forbes listed his income at $94 million. Runner-up Stephen King makes a paltry $39 million. The average writer earns less than $1,000 a year/$83 a month/ $19 a week. That’s about 48 cents per hour. What happened to minimum wage? Only 1.3% of traditionally published writers earned more than $100,000 a year. In traditional publishing, the average royalty is 10-12% on hardcover books; 8% on paperbacks. Literary agents take a 15% commission out of an author’s income. Self-published or indie authors get higher royalties but they’re also responsible for paying editors, book cover designers, marketing people . . . the costs add up. Self-published books sell, on average, less than 200 copies per title. If the author prices them at $10 each, that’s a total of $2000 before expenses. If you sell only 10 books, then the author loses money, time, and faith. Would you buy an indie book for $10? Many are free; most range from 99 cents to $3.99. Authors write in their spare time because they can’t earn enough money from writing to survive. Ever hear of a starving artist? J.K. Rowling survived on public assistance when she wrote the first Harry Potter book. Not every writer is J.K. Rowling and not every book is Harry Potter. Rowling now makes about $14 million a year. Ironically, most writers are notorious optimists. They believe their book is the next bestseller. “Most writers,” Jeremy Greenfield, Digital Book World editorial director says, “write because they want to share something with the world or gain recognition of some sort . . . The top 2% of authors [actually] make a good living . . .” Clearly, no one is very interested in the bottom 98%. Isn’t that what they say about our economy? These days, many people use e-readers and tablets for their books. The increase in e-book sales has been reported as high as two hundred percent. Some call it the most dramatic change in reading since the 15th century when Johannes Gutenberg invented the printing press. What will tomorrow bring? With Borders gone and Barnes & Noble staggering, it’s anyone’s guess. All we know is, according to Pew Research, 76% of Americans 18 or older, have read at least one book in the past year. Seven in ten adults read a book in print, 28% read an e-book, and 14% listened to an audio book. Interestingly, these numbers hold up through gender, ethnicity, age, and education. 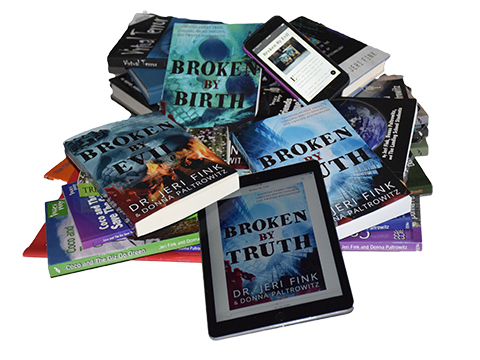 Recently, Broken By Truth, my newest thriller and the first in a series of 7 books, became an Amazon bestseller. The only place I earned $94 million was in my dreams. There’s always the next book . . .